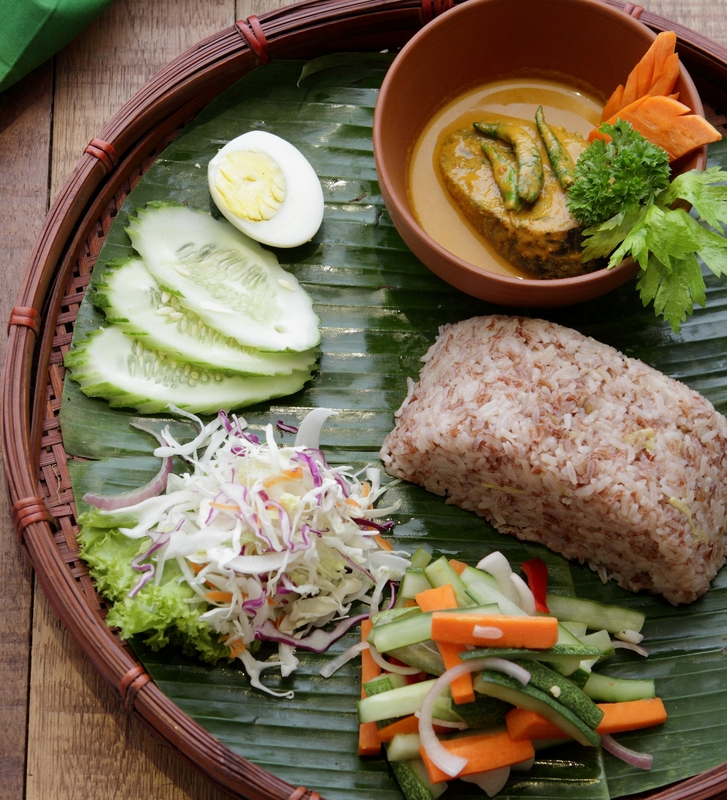 Traditionally, nasi dagang was usually eaten for breakfast and on special celebrations, such as on Hari Raya morning. This dish has become so popular, it is now eaten all the time. Drain the rice, then place in a rice cooker filled with 1.5 litres of water. Cook for about 15 minutes until rice is half-cooked. Add the remaining ingredients and steam until rice is fully cooked. Sprinkle some salt on the fish and steam until cooked, about 20 minutes. Remove from heat and set aside. Place the shallots, turmeric root, young ginger and galangal into a blender and blitz to form a paste – add some water if necessary. Heat a pot over medium heat, add the oil and sauté the paste. Once fragrant, add the curry powder and stir until brown, about 15 minutes. Pour in the coconut milk and bring to a boil. Add the fish, bird’s eye chillies, sugar and salt and cook for 20 minutes. Remove from heat. Place all the ingredients into a bowl and mix well. Leave to pickle for at least 1 hour. Pack the rice into a rectangular container and unmould onto a plate or dulang (tray) lined with a banana leaf. Ladle some gulai ikan tongkol into a bowl and place on the tray, along with the acar and serving accompaniments. Saya nak cadangkan, daripada dapat sukatan untuk 60 orang, why not buat potluck sahaja? Ajak kawan atau saudara rapat dan bincangkan sesama sendiri. Mungkin 6 orang untuk masak nasi, 3-4 orang masak gulai, 3-4 orang untuk sediakan jelatah, dan lain-lain. Sharing masak macam ni lebih seronok dan meriah daripada host sendiri (atau dgn keluarganya) sediakan makanan yang selazat ini. Harap saudari cuba cara ini. I am the member of the Kuali before but am in Australia now. I like all the Recipes for Kuali. They use to sent me A recipe magazine. But that many years ago. I love Kuali Recipe.